My daughter received this book as a gift. The cover looks cute and adorable but I will be honest, I initially dismissed this book as a good book for when she’s a bit older. My daughter can read common kid words, but looking at the vocabulary of the book, I knew there were words that she doesn’t know yet, both how to read them or the meaning. For example, I’m pretty sure she doesn’t know what a pine-bough schoolhouse is, or words like shrew, stow, or architect. And did I mention that it’s a chapter book? The illustrations tho, although being black and white, are so adorable and enticing. Each page is littered with illustrations of this cute nature-filled, mouse-sized world. It draws you in and my daughter just had to know what this story was about. So I agreed to read it to her. The story is about 8 year old Sophie Mouse who lives in a forest with other animal friends. When Sophie Mouse and her friends go back to school after the summer holidays, they discover they have a new classmate, and he’s a snake. None of them had ever met a snake before. The only thing they knew about snakes came from books – scary stories about poisonous sea snakes or hissing ghost snakes. Overcoming their fears and not prejudging their classmate before they get to know him is a lesson Sophie and her friends end up learning. Not prejudging a book as too advanced is a lesson I ended up learning. The pictures have my daughter glued from the start. And each chapter’s cliff hanger ending has my daughter begging me to read more. Yes there are a few bigger words but not enough to distract from the story, and a great way to expand my daughter’s vocabulary. The books are marketed to be for 5-9 year olds, so she is just on the younger side of this age group. We have recently finished reading this book together and to continue my daughter’s enjoyment of “The Adventures of Sophie Mouse”, I quickly ordered the next 2 chapter books of the series which we are currently reading together. Sophie Mouse likes to paint, and she uses flowers and berries to make the colours for her paint. This idea is subtly woven through the first book. And in the last chapter, she gets to paint with her newest colour “Buttercup yellow”. In the second book, Sophie Mouse and her best friend go to a part of the forest that’s far from her home at Pine Needle Grove. Sophie is desperate to go there to get emerald berries that produce a great dye colour which would make a great paint colour. My daughter and I decided to go on our own search for plants, flowers or berries that would make a great dye for a home made paint. We did numerous nature walks this past month looking for things that might make a good colour. First things first tho, I gave my daughter a couple of rules to follow. She was not to put anything in her mouth without permission, and she was not to go into random areas without me, as she is not yet able to identify poison ivy or stinging nettle. Also, I explained to her that we weren’t going to pick too much of a flower or plant, and never by the roots, as we never wanted to pick more than could easily be replenished. We had quite a lot of fun galavanting through nature. The first time we came home with a sampling of different flowers and berries we thought might make a good colour. We took those samplings and tried to identify the plants by name. We did research in books and on the computer together of the different plant characteristics to try to make a positive identification. We studied the characteristics of the leaves, the petals, the stem, etc. It wasn’t as easy as just looking at a picture, but it was necessary to also read about the identifying marks of the wildflower. I asked my daughter questions like is the stem prickly or smooth? What colour and how many petals are on the wildflower? We would then learn a bit about the plant we identified, for example is it edible or toxic to humans or animals? Then it was time to play with our plants. My daughter got to pluck all the petals off the flowers we picked. We put each kind of wildflower petals or berries in a cup, and later we poured a small amount of hot water over them. After letting it sit, we would see if it made a good colour or not. To be truthful, we haven’t had a lot of success finding good dye producing plants. All the results we have had, have been very different than what we initially predicted them to be. Once, we found a wildflower that produced a good blue liquid. Letting it sit longer to see if we could get the water even bluer, only caused the colour to disappear. 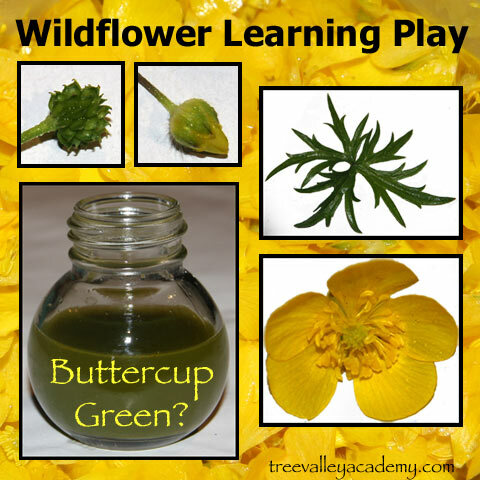 And when on the hunt for a nice yellow, the best results we found were from the Buttercup, just like in the book. So armed with that discovery, we went out again (this time in the rain) to pick quite a few Buttercups. This time the liquid was not nearly as nice a yellow – perhaps the rain had something to do with that. 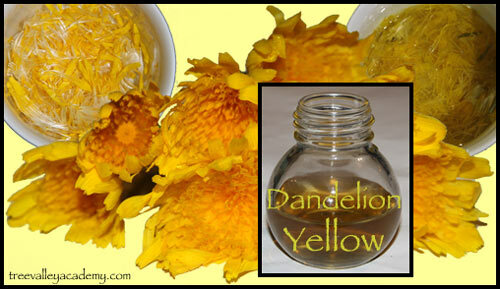 I thought maybe if we blended the petals up, we might get a stronger yellow, but that resulted in a dark green, lol. Oh well, the search has been fun and opened the door to a great learning experience. My 5 year old now has quite a few plants, trees, bushes, and wild flowers that she can readily identify. She has learned some foraging skills, and not to be forgotten she learned to be observant to more of the smaller details in a forest. We will continue our forest and nature learning walks this summer, and who knows, we might still stumble upon the perfect dye producing plant! Even if we don’t, I’m sure it will lead to quite a few more outdoor learning adventures. Enter the Woods with The Gruffalo Bundle Giveaway! Get ready for some fun in the woods with this month’s Gruffalo Bundle Giveaway! The Gruffalo is a fun children’s book set in the woods and has a very funny, yet easy to follow story. 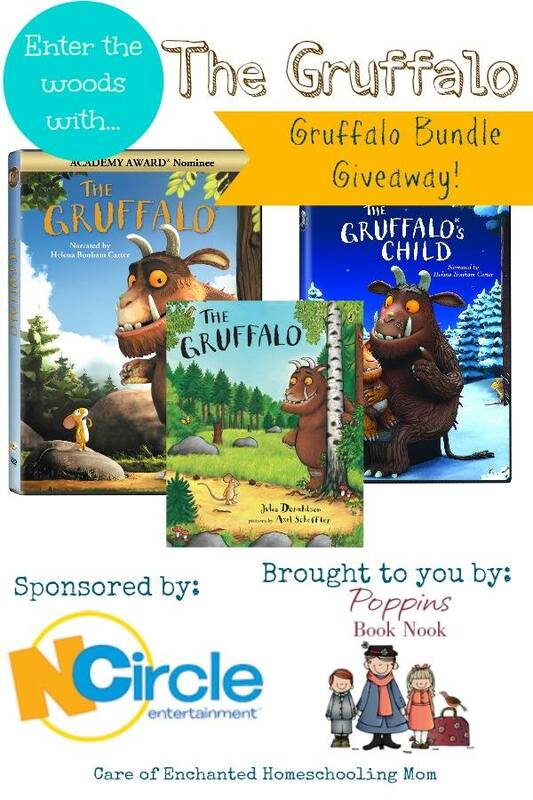 This month the Poppins Book Nook group has partnered with NCircle Entertainment to offer readers a chance to win a brand new copy of The Gruffalo storybook, The Gruffalo DVD, and the Gruffalo’s Child DVD. This month’s lucky winner will enjoy all this woods themed family storybook and DVD fun with their family compliments of NCircle Entertainment and the Poppins Book Nook cohosts. Entrants must be 18 years or older and reside in a country that receives U.S. Postal mail. This giveaway is brought to you by the company NCircle Entertainment in connection with Enchanted Homeschooling Mom who is owner and founder of the Poppins Book Nook. By entering this giveaway you are also acknowledging that you have read and agree to all of the PromoSimple terms & conditions as well as Enchanted Homeschooling Mom’s disclosures found here. These sound like some really cute books that my girls might enjoy. I am in search mode for them right now, especially my 8 year old who zings through books. Sounds like you had a great time in nature. Love that you tried to make your own paints. Too cool. Thanks for stopping by and sharing with Littles Learning Link Up. I hope you will stop by and share again soon. Love this idea! 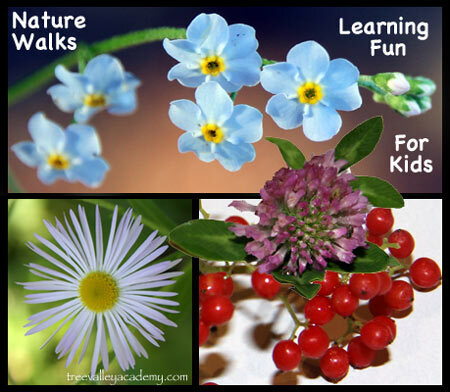 I’m always looking for ways to get my littles outside and learn at the same time. I also think my daughter would love these books! Thank you so much for sharing.